The DT2 features an elegant designed dual port, built-in wand holder and handle console. Using a state of the art digital screen, determining vacuum pressure is precise, accurate and quick. The dual port allows dry exfoliation and serum infusion quickly and easily. It is convenient, easy to use, portable and quiet. Skin Resurfacing is an exfoliation technique for removing the topmost layer of skin leaving it more supple and vibrant. The DT2 Skin Resurfacing System removes this layer by gently exfoliating the skin with natural diamond chips that are at the tip of the wand, while at the same time vacuuming the exfoliated skin cells away in a controlled manner. Removing this outer layer of dead skin cells leaves a smother texture and promotes the growth of healthy new skin cells. Skin Resurfacing also stimulates the elastic tissue beneath the surface of the skin resulting in a healthier and firmer appearance. This treatment can be performed on the face, neck, chest, hands, back, elbows, and feet. It can be used alone, or in combination with other treatments. A trained clinician, nurse, aesthetician or physician administers treatments. 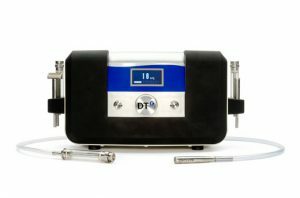 The DT2 Skin Resurfacing treatment is non-invasive, pain-free and requires no down time afterwards. To achieve maximum results, several treatments are recommended to a healthier, younger looking skin.